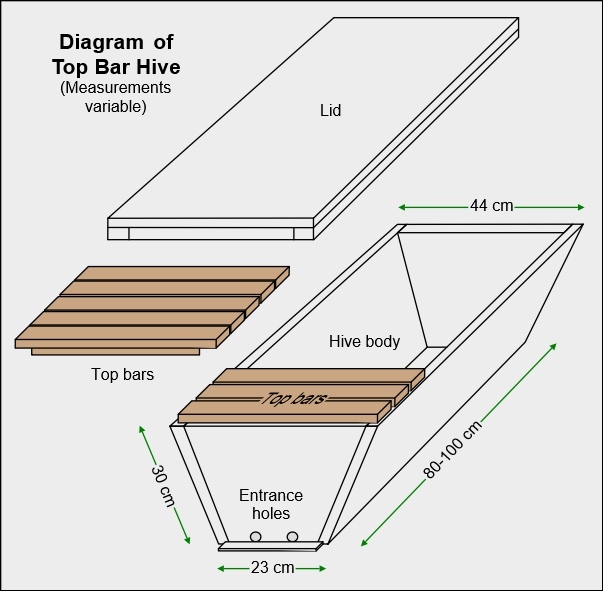 The drawing shows the main features of the original Kenyan top bar hive introduced by the ‘Bees for Development’ programme and designed to be easily constructed with cheap local materials by beekeepers in Kenya and other African countries. The sloping sides mimic the catenary shape of natural comb. Bees are encouraged to start building their comb in straight lines by providing ridges on the underside of the top bars or sometimes by providing a beeswax strip on the lower edge of the bars. As the comb extends downwards some will be attached to the sides and/or base of the hive and may even curve to cover other top bars. This makes inspecting the hive problematic. Top bar hives can be made in all sizes to suit your beekeeping requirements and the materials available in your locality. You could even make the top bars into frames if you wish. There is also a straight sided version of the top bar hive, called the Tanzanian hive, which retains the simplicity of the design. and the use of naturally built comb – no contamination from foundation wax plus cell size is as the bees want it. The obvious disadvantage is that top bar hives are not designed to be moved. However, inspecting individual combs can be achieved but may entail cutting through sides and base before lifting out. Having a good mentor at the start of your beekeeping career should make things easier as they will be able to demonstrate best practice, for example, how to use a comb holder for lifting comb gently. No provision is made for adding extra space should it be required for honey storage. For comparison, the dimensions shown would approximate to 70 litres of comb space, adequate for most colonies and similar to two National brood boxes. Alternative management techniques such as splitting or early harvesting can be employed to overcome space problems. Harvesting honey usually means cutting out comb and either taking the crop as cut comb or crushing and straining. This produces more wax but bees have to build new comb before storing more honey. Honey crops are usually smaller compared to a vertical supered hive as honey is spread across a number of combs still with brood, and more honey is converted to make the additional wax. This is not a disadvantage if the honey is not wanted for human consumption or the beekeeper does not wish to feed for winter stores. The basic top bar hive design has been hijacked by amateur beekeepers in many countries who wish to keep bees in ways that are seen as more natural or sustainable. All manner of modifications have been proposed such as legs to maintain the hive at a comfortable working height, observation windows, extra thick wood for better insulation, hinged roof with gas struts, varroa mesh floors, biological sumps, moveable division boards for splitting colonies, … The list goes on! These hives should be compared to the Warré hive, a top bar hive built vertically. This is a more “natural” hollow tree shape, being relatively tall and thin. It is argued that the Warré configuration is more suited to cooler climates, compared with a design for warmer climates where heat loss may be more desirable than heat retention.